Any suggestions for how to "dress up" a bride with eyeglasses? I wear wire rimmed glasses that are a subtle cat-eye shape (can't be too crazy since I work in a hospital) and I can't wear contacts b/c of a medical condition. However, I find that glasses tend to "dress down" any fancy outfit I wear and I never see wedding photos where the bride has glasses. If you love your frames and feel like they're really part of your face and identity, or are planning a low-key, mellow wedding, stick with the glasses you've got. If you're a make-uppy type, you could go for extra dramatic eye make-up under your usual specs to add some flair. Dude: when was the last time you tried quality fake eyelashes? Bridget Bardot in spectacles anyone? Wearing a pair of one-of-a-kind frames that aren't your usuals would make a great visual impact on your wedding — I say go for frames that coordinate with your dress. To be even more daring and dramatic, go for frames that coordinate with your flowers. Let your glasses be an extension of your bouquet: a visual splash! You could also go super light and understated — ie frameless lenses that barely show. Another thing to consider is having your photographer take some of your wedding shots angled slightly from above. Everyone who wears glasses knows the infamous "over the lenses" shot (alternately called "Bloggerface" or "MySpace pose"), and it's common for a reason: It's a great way to keep your glasses on, but let your eyes show. Want to see tons more brides in glasses? Click here to see my whole collection of posts about bespectacled brides! i'm a little offended at the thought that the devices i need to see properly might be seen (hah) as making me look less dressed up. i don't wear contacts, i'm not getting Lasik before the wedding – i'll be wearing my glasses because I WEAR GLASSES. How is this about looking dressed down? Kate, I'm not sure Kerith was saying anyone was telling her glasses didn't look right — she was saying she felt like they "dressed down" her outfit, which I understand. If you wear the same frames every day, they start to feel like daily wear — like your favorite jeans. I don't think this is about anyone pressuring Kerith not to wear her glasses, but her trying to figure out how to make something she wears every day feel a little more fancy on her wedding day. I have rather plain wire rims as well. I say wear them and do dramatic eyes – the nice thing about thin wire rims is that they allow for my eye makeup to take center stage. Wow! You look incredible. If anything, I think your glasses help to make your eyes stand out even more. I also wore my glasses for our September wedding. I did the white dress thing and was more worried about the veil or no-veil question than the wearing of my glasses… I know the glasses work, but how often do I sport a freakin' veil??? I'll admit that I had to get over the same feeling of "will I look too everyday?" and spent some time trying on each of my pairs of frames with the dress. It came down to wanting to look like ME on my wedding day. The other thing that made a difference is the eye makeup…. go big and bust out the false lashes! I told my make-up person I was wearing glasses and she amped it up accordingly… a little more intense color and some lashes made it all come together. i say option number 1 as well – it's definitely cheaper to just go with dramatic eye make up than to get new glasses! though option number 2 is a good way to get those crazy cat eyes you always wanted!! i felt the same way as kerith – everyday glasses can feel dress down. so i had fake lashes put on for my wedding, and i felt totally fancy! 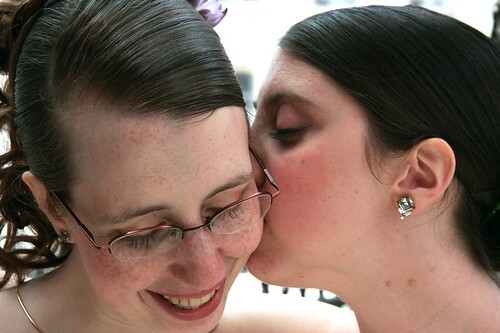 the same goes with my bespectacled sisters / bridesmaids – nice make-up "dressed up" their glasses with their outfits. I think I'm going to rock option 2 as a good excuse to get some "fun" frames. My work glasses are nice and professionally understated, but I'd like a pair that are a little more flirty (for both the wedding and for when I'm not at work). My dress is going to be cream and gold colors so I think I'm going to look for some light tortoise shell cat eye frames ;). Awesome post! Now all I have to worry about is how to dress up my prosthetic leg. Talk about daily wear… Ha! I have to say I've been surprised by the amount of people that think wearing glasses to your wedding is unfashionable. In fact, when I showed one of my favorite pictures (of my best friend and her husband on the day of their handfasting), she made the comment "next time, tell them to take off their glasses." I think she looks super cute and when glasses have become part of your look it can look really really odd if you don't wear them, I'm always slightly freaked out when my best friend wears contacts as I've know her with glasses since we were 12. She just doesn't look like her without them! I love the idea of getting 'wedding' glasses, I would if I could afford them! Ok, mega-old comment, but I just have to reply: I think that is the most beautiful wedding dress I've ever seen! I don't know why, I'm just in love with it. And yes, they both look cute with the glasses. Lovely. I wore glasses for my wedding in July. Can't see without them! I had a few people tell me how brave I was for doing that. hi! i am the original poster and am so happy to see so many people putting in their two cents! thank you for the photos!! to clarify, i don't think my concern about my glasses is related to fashion or pressure to look more like a conventional bride. i am considering wearing a flower behind my ear or a cute little flower net veil and don't want my (small) head to look cluttered. in the past, i've felt like my bespectacled face is too busy even with the addition of non-stud earrings. i totally agree though, about being freaked out when i see people who usually wear glasses go without…it's like when i was little and my dad shaved his mustache! scary. thanks for all the ideas — and thank you ariel for such a great site! I know this thread is from ages ago, but im just starting to plan my wedding and as a daily specs wearer im trying to decide what to do. I wear a beautiful pair of zebra-print glasses every day – not very bridadl – and Im just not me in my contacts. I originally fancied a birdcage veil — too much with specs too?! and then theres magazines (hair, makeup, dresses) and next to none wear glasses! I realise its easier to photograph people without glasses, but we need options too! Cara — that picture is super cute! I love her dress too! It's absolutely stunning and elegant. I love the neckline and the way it drapes. Absolutely gorgeous. What a great variety of pictures. I wear glasses and just got new ones out of necessity after losing a pair. It never occured to me to worry about wearing them or not. I have to wear them and one thing that my fiance is adamant about it me looking like I look everyday. So no make up, which I never wear and no change in glasses. That's fine with me, it's easier! You know what- and this may sound funny- but I'm just so used to my glasses that I forget I even wear them. This issue had never even come up in my mind before this post! I'm fortunate enough that I can go without my glasses. I certainly wouldn't drive sans specs; or read for that matter; but I can walk around and be more than fine. I imagine I'll take them off for the ceremony, if only for the kiss shot, and wear them the rest of the day. But all I needed was one excuse to get 'dress up' frames and I'm off and running! I'll recommend Optical4Less.com, for those that want to buy eyeglasses for cheap, and don't mind that they're made in Hong Kong. I needed to get new glasses this year, and on my grad student stipend, I couldn't afford to get them from Lenscrafters or Walmart, etc. $48 for two pairs, including shipping, worked for me! I got one pair of boring frames and a second pair that's more stylish (I wear the stylish ones everyday!). I love all the photos people sent in! I think if you wear glasses EVERDAY of your life you should probably wear them on your wedding day. But I must say from a photographers point of view…there is that glare issue to deal with. Some glass is worse than others. I would test that out. If yo aways have glare in candid photos with your current glasses you may want to pick something else out for your wedding. Something with less glare! So happy about this post! I too have that little voice in my head that's all "you can't wear your GLASSES to an event with formal wear and professional photography!!" But, honestly, I think I look a hell of a lot better with my minimalist wire frames. If I went out and got contacts just for my wedding, I'd feel weird all day and be paranoid about my nose looking too big or the wrinkles under my eyes showing or whatever else that my glasses normally camouflage. No thanks! That's me, in my wedding glory. Not only did I wear my purple, yes purple glasses, I am a big fat happy bride! I know, so unconventional. I decided that I was not going to starve myself for anything, mainly because I enjoy being fat. Also, I caught alot of crap about my glasses, "oh, you should get contacts" or "take them off for the pictures" and I was not about to do that. I love my glasses, and I don't think my husband would have married me without them! So I say wear 'em, or you'll regret not looking like yourself in the photos! I wore glasses and I never thought about about not wearing them for one second. I know that I wouldn't have looked like me without them, particularly as I've worn glasses since I was 12. If you are worried about it, you can try out different frames, a new pair might suit your dress better. Its also a good idea to wear stronger eye makeup if you are going to wear glasses, because if the colours are too subtle they can get lost. I am so glad I found this. Some people have been telling me I should not wear my glasses. I think that is insane. It is part of who I am. I have 5 pairs now and will be getting a new "wedding" pair. I am really excited about it. All mine are super funky and are special in some way. So now I will have a pair that I will wear for the first time on this most important day. I live in New Zealand. A bride with glasses won 'Bride of the Year' in a competition run by one of our major wedding mags a year or two ago. She looked stunning. No you don't need an eye test! It's a blurry shot, sorry, I can't work my scanner today so it's a photo of a photo. I just got engaged on New Years Eve and it wasn't even a week before someone told me flat out that I should definitely not wear my glasses for the wedding. It was a friend of a friend at our engagement party. The friend said I should only wear them for half the pictures. Others of course chimed in and said I should look into getting contacts. Like a lot of the rest of you, I don't feel like myself without glasses and a lot of people don't think I look like myself without glasses. I never even imagined not wearing them for my wedding before that. And it sort of hurt to think that people wouldn't respect that part of my identity and my wishes for a wedding that was uniquely us. These same people also scoffed at our decision to have a winter wedding in Wisconsin with snow (I live in Florida but grew up in the midwest). So I am quite relieved to hear that others are trying to figure out the glasses thing and are boldly wearing glasses for their whole weddings. I plan to do that. And I am totally getting a special funky wedding pair. It should go very nicely with my hemp dress with sweater idea. I'm getting married in 5 weeks and from the beginning have planned to wear my glasses. I also can't wear contact lenses but even if I did I like the look of my glasses better. I heard a lot of comments about not wearing any glasses and walking blind or just put one contact in the eye that can wear it. All of these sounded ridiculous. If I had any doubts they were eliminated when my fiance (an occasional glasses wearer) said it wouldn't be right if I didn't give him my signature "you've got to be kidding me" glare over the top of my glasses on our wedding day. My mom (who is also my glasses wearing matron of honor) said stumbling blindly down the aisle is absurd. I even asked my friend our photographer and she was excited about photographing me with glasses on since she'd never had a bride wear them before. When the support rallied, I decided not only that I was going to wear them but they would be part of the outfit. I found an awesome pair of dark brown frames with pink on the inside.I have pale skin and red hair so they stand out which is cool with me since I consider them my eye makeup. To top it all off, to compliment the "dramatic eye" I opted to have bright red lipstick too. If you think your glasses are going to dress down your look stop considering them glasses and start thinking of them as "functional accesories" then you can really plan your overall look with them in mind. Have fun and scoff at convention. I wore my glasses on my wedding day, and I cannot even begin to tell you how glad I am that I did. My photographer had a blast with them, too. His only advice, which I'm very glad I followed, was to have an anti-reflective coating put on the lenses (just the normal coating they offer everywhere to cut down on glare while you're driving, etc.). This ensured that both the professional shots and candids snapped by my friends showed my eyes clearly! My photographer just posted my bridals on her blog. I love Anne and if your in Northern Louisiana you should look her up. I got so many comments before the wedding about my intention of wearing glasses that I literally googled "brides with glasses" and found this page! I did end up wearing them, of course, and everything turned out just fine. Be yourself! The last thing you need to worry about on your wedding day is being able to see properly, or not looking like yourself! My husband wore his glasses as well as 50% of our bridal party. The pictures turned out beautifully so don't believe any of that "your pictures will be ruined!" nonsense. This thread is interesting to me. I have needed glasses since 2nd grade, and started wearing contacts in 7th grade. I developed severe dry eye sydrome a few years ago and have had to stop the contacts and wear glasses every day since. It's uncomfortable for me, especially in the summers. I like the glasses, but miss the ease of contacts. I was recently approved to wear contacts again, and I feel that I look more like myself with them in! It was weird to get used to (I keep trying to push up my glasses, especially when I get nervous). But I am very excited to not have to wear my contacts on my wedding day since I feel like I look more like myself this way. As for those who feel so bold wearing their glasses all day — it's who you are! You aren't bold for being you! I can't even believe how rude people are to make you feel differently. PLEASE PLEASE be comfortable in who you are! Soooo glad I found this! I, too, googled "brides with glasses." I can't wear contacts due to a medical condition and every single bridal magazine I look at, none of the featured brides (and obviously the models) are wearing glasses. I've got copper colored wire rims…I like the idea of getting wedding glasses, just one more expense to add to the budget!!! I'm so glad no one has asked me about wearing my glasses at the wedding, but I'm sure it will eventually come up, and I can't wait to give them an earful!! Thanks, ladies! I've been having the issue about whether or not to wear my glasses on my wedding day, but my friends all say I'm me with glasses and I would look weird without them, so I'll most likely wear them. I could go without wearing them for the ceremony but it'd hurt my eyes and I don't want to be squinting the whole way through! The frames are the exact same color as my hair, so they blend in anyway, and I'm sure when I get my hair done the glasses won't make my outfit look any less casual than a bride without glasses. I say, if you want to wear your glasses on your wedding day, wear them, if not, don't. Just go with what feels right for you. As a wedding photographer who has been to 1000+ weddings, I say wear your glasses, but do quite a few "portrait" type photos without them — I say this because you never know if you're going to get contacts, or ? – and then your "look" will change. Do a bit of both, and then you'll have no regrets. I've had glasses since i was 18 months old. That's right, 18 months old. They had ear pieces that went all the way around my ear so that they wouldn't fall off. there is no way that i'd get married with out them. I feel very vulnerable without them. (anything could just fly up and poke me in the eye!). Plus, because my glasses have UV protection, my eye area is very very very pale. I'd look really strange with out them. When i got my passport the photo place made me take them off. It just doesn't look like me. When i was a senior in high school i had to get the lenses taken out of my frames for my senior pictures so that there wouldn't be any glare, and i had a headache the rest of the day. Not something i want to do again. Not to mention i have a lazy eye, and when they get tired (from not wearing my glasses) i get very very cross eyed! now that would be flattering. i'm keeping my awesome glasses on during my wedding. Has anyone worn a birdcage veil with their glasses? That is the biggest issue I am having right now – I love my glass but I love birdcage veils and they don't seem to work together very well. Although, the red veil picture at the top of this listing looks pretty cute. Thank you so much for this blog. I have been telling people that I am going to wear my glasses on my wedding day and they are trying to convince me to do other wise. I love my glasses and they are apart of me so why wouldn't they be apart of my wedding attire. I'm an optician/optometrist so there are 2 rules you must follow if getting wedding glasses. The first is getting an anti-reflective coating on the lenses – there's nothing worse then having a fantastic frame but none of the pictures show your eyes because of reflections. The second is to not get photochromic lenses. These change colour in the sun, so are fine indoors, but all your photos ourside look very strange. My dad had a pair at my aunt's wedding a few years back and looked like the 'blind man' at the back of the group. Yikes. And this is why I won't be wearing my glasses at my wedding. They don't have the non-reflective coating, and they are most definitely transitions lenses. All of our photos will likely be taken outdoors. A friend of mine wore glasses with her birdcage veil. She had a 1950s tea length dress (from a thrift store–so awesome!) with a lavender sash and the big dark, retro frames that are so popular now. She also wore a flower in her hair (might've been a peony, as it was a largish bloom) and had white lace gloves to complete the look. I wish I knew how to add pictures so I could show you! Who is the girl in the first and last photo with the cateye glasses? I want to see more pictures of her wedding and outfit! Her style is perfect and just what I'm trying to achieve with my wedding next year. also I think glasses are really in style right now and if I had to wear glasses I would definitely go out and buy a pair of stylish vintage frames that went with my dress. Glasses are cute!